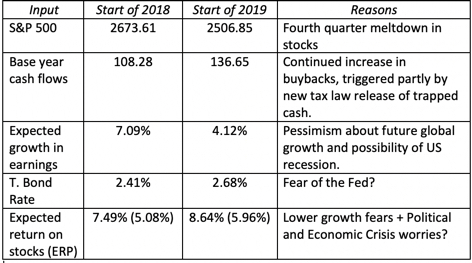 Musings on Markets: January 2019 Data Update 1: A reminder that equities are risky, in case you forgot! In bull markets, investors, both professional and amateur, often pay lip service to the notion of risk, but blithely ignore its relevance in both asset allocation and stock selection, convinced that every dip in stock prices is a buying opportunity, and soothed by bromides that stocks always win in the long term. 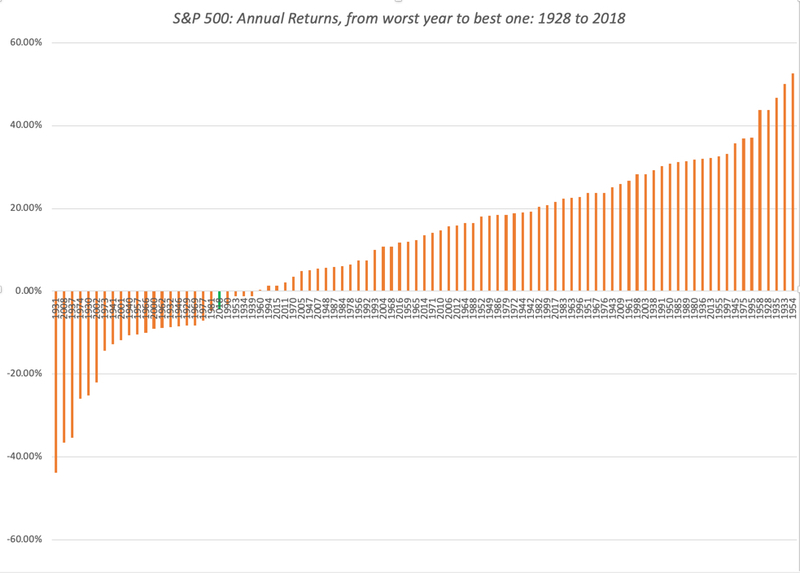 It is therefore healthy, albeit painful, to be reminded that the risk in stocks is real, and that there is a reason why investors earn a premium for investing in equities, as opposed to safer investments, and that is the message that markets around the world delivered in the last quarter of 2018. 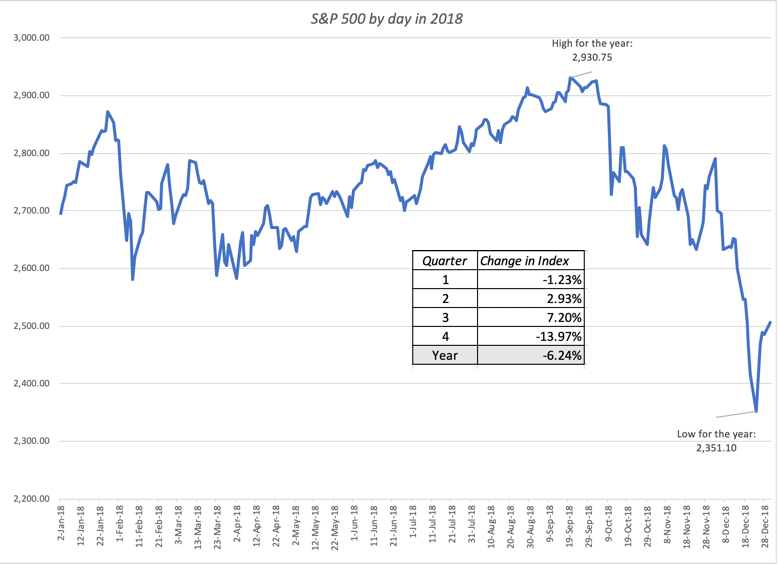 The stock market started 2018 on a roll, having posted nine consecutive up years, making the crisis of 2008 seem like a distant memory. True to form, stocks rose in January, led by the FAANG (Facebook, Amazon, Apple, Netflix and Google) stocks and momentum investors celebrated. The first wake up call of the year came in February, first as the market responded negatively to macroeconomic reports of higher inflation, and then as Facebook and Google stumbled from self-inflicted wounds. The market shook off its tech blues by the end of March and continued to rise through the summer, with the S&P 500 peaking for the year at 2931 on September 20, 2018. For the many investors who were already counting their winnings for the year, the last quarter of 2018 was a shock, as volatility returned to the market with a vengeance. In October, the S&P 500 dropped by 6.94%, though it felt far worse because of the day-to-day and intraday price swings. In November, the S&P 500 was flat, but volatility continued unabated. In December, US equities finally succumbed to selling pressures, as a sharp selloff pushed stocks close to the "bear market" threshold, before recovering a little towards the end of the year. Over the course of the year, every major US equity index took a hit, but the variation across the indices was modest. 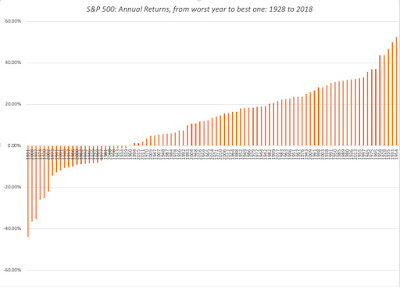 I know that this is small consolation, if you lost money last year, but looking at annual returns on stocks in the last 90 years, there have been twenty years with more negative returns. In short, it was a bad year for stocks, but it felt far worse for three reasons. First, after nine good years for the market, investors were lulled into a false sense of complacency about the capacity of stocks to keep delivering positive returns. 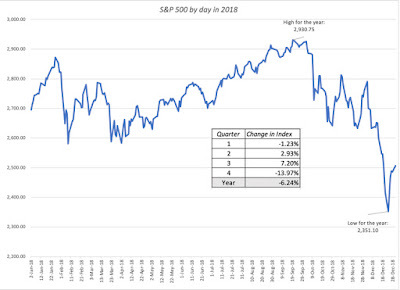 Second, the negative returns were all in the last quarter of the year, making the hit seem larger (from the highs of September 2018) and more immediate. Third, the intraday and day-to-day volatility exacerbated the fear factor, and those investors who reacted by trading faced far larger losses. As with any measure of the market, it requires estimates for the future (expected cash flows and growth rates), but it is not only forward looking and dynamic (changing as the market moves), but also surprisingly robust and comprehensive in its coverage of fundamentals. At the start of 2018, I estimated the equity risk premium, using the index at that point in time (2673.61), the 10-year treasury bond rate on that day (2.41%) and the growth rate that analysts were projecting for earnings for the index (7.05%). During October, for instance, the equity risk premium moved from 5.38% at the start of the month to 5.76% by the end of the month, with wide swings during the course of the month. Going into 2019, investors are clearly less upbeat than they were in 2018 about future growth and more worried about future crises, but companies are continuing to return cash at a pace that exceeds expectations. 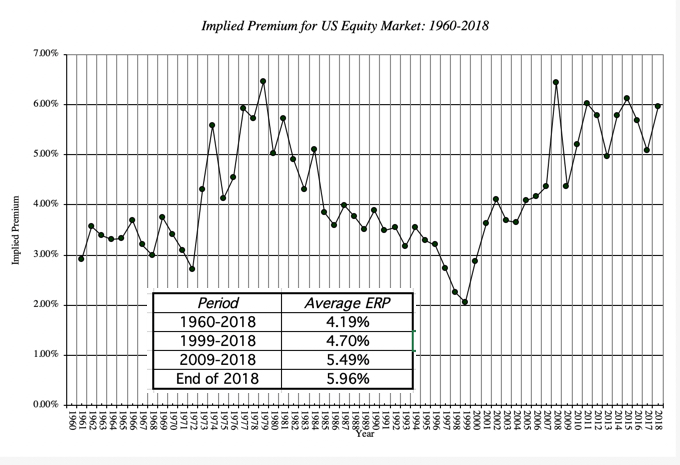 At its current level of 5.96%, the equity risk premium is in the top decile of historical numbers, exceeded only by the equity risk premiums in three other years, 1979, 2009 and 2011. Viewed purely on that basis, the equity market is more under valued than over valued right now. Recession and lower growth: While there was almost no talk about a possible recession either globally or in the US, at the start of 2018, some analysts, albeit a minority, are raising the possibility that the economy would slow down enough to push it into recession, at the start of 2019. While the lower earnings growth used in the 2019 computation already incorporates some of this worry, a recession would make even the lower number optimistic. 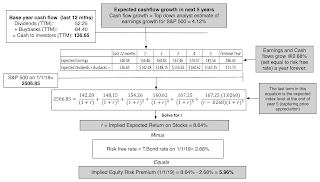 In the table below, I have estimated the effect on the equity risk premium of lower growth, and note that even with a compounded growth rate of -3% a year for the next five years, the ERP stays above the historical average of 4.19%. Higher interest rates: The fear of the Fed has roiled markets for much of the last decade, and while it has played out as higher short term interest rates for the last two years, the ten-year bond rate, after a surge over 3% in 2018, is now back to 2.68%. There is the possibility that higher inflation and economic growth rate can push this number higher, but it is difficult to see how this would happen if recession fears pan out. In fact, as I noted in this post from earlier in the year, higher interest rates, if the trigger is higher real growth (and not higher inflation), could be a positive for stocks, not a negative. Pullback on cash flows: US companies have been returning huge amounts of cash in the form of stock buybacks and dividends. In 2018, for instance, dividends and buybacks amounted to 92% of aggregate earnings, higher than the 84.60% paid out, on average, between 2009 and 2018, but still lower than the numbers in excess of 100% posted in 2015 and 2016. Assuming that the payout will adjust over time to 85.07%, reflecting expected long term growth, lowers the ERP to 5.55%, still well above historical levels. Political and Economic Crises: The trade war and the Brexit mess will play out this year and each has the potential to scare markets enough to justify the higher ERP that we are observing. In addition, it goes without saying that there will be at least a crisis or two that are not on the radar right now that will hit markets, an unwanted side effect of globalization. Looking at how the equity risk premium will be affected by each of these variables, I think that the market has priced in already for shocks on at least two of these variables, in the form of lower growth and political/economic crises, and can withstand fairly significant bad news on the other two. I have long argued that it is better to be transparently wrong than opaquely right, when making investment forecasts. 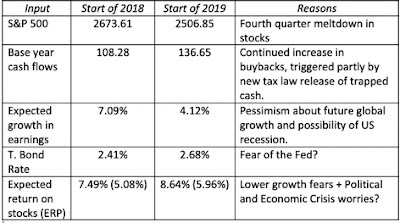 In keeping with my own advice, I believe that stocks are more likely to go up in 2019, than down, given the information that I have now. That said, if I am wrong, it will be because I have under estimated how much economic growth will slow in the coming year and the magnitude of economic crises. Odds are that I will see the tell tale signs too late to protect myself fully against any resulting market corrections, but that is not my game anyway. Data Update 1: A Reminder that equities are risky, in case you forgot! Data Update 5: Of Hurdle Rates and Funding Costs! Data Update 6: Profitability and Value Creation! Data Update 7: Debt, neither poison nor nectar! Data Update 8: Dividends and Buybacks - Fact and Fiction! Data Update 9: Playing the Pricing Game! 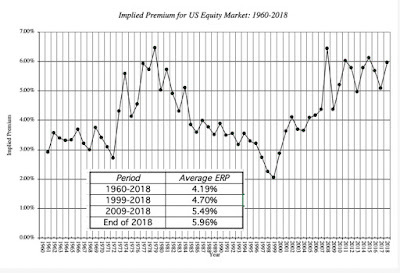 Hey Aswath, unless I'm reading the graph wrong, this portion is incorrect: At its current level of 5.96%, the equity risk premium is in the top decile of historical numbers, exceeded only by the equity risk premiums in three other years, 1979, 2009 and 2011. It should be: 1979, 2008, 2011, and 2015.
great article and very interesting. I tried to rebuild the ERP myself. However I got some questions. 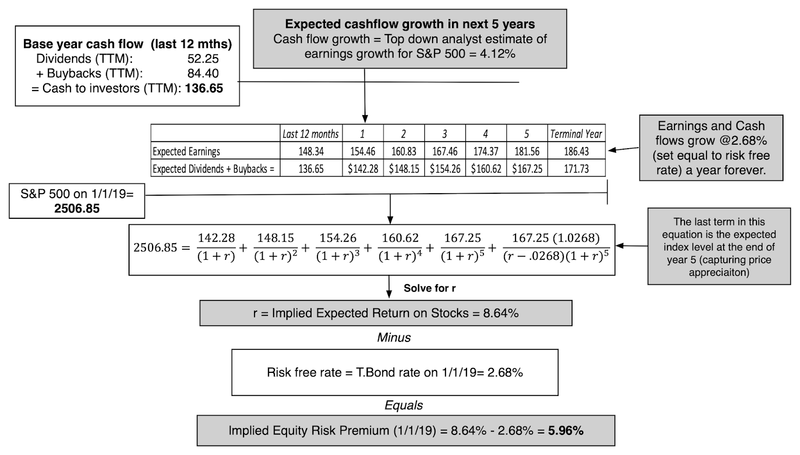 Where do find the number on the expected earnings growth for five years. I got Bloomberg and see it for Y+1, Y+2 but not for a longer time frame. ? How can I come up with the split Dividends and buybacks? I don't see a buyback number in Bloomberg? I might be missing something, but it seems the unit adjuster that you use for quarterly earnings is outdated, since it refers to 2016, not 2018. Thanks for the continuous update on data on your website. A quick question as I am a bit confused with the various ERP values you put on your frontpage monthly. Could you add a quick comment (or a video or...) what is the difference in essence between those values ? 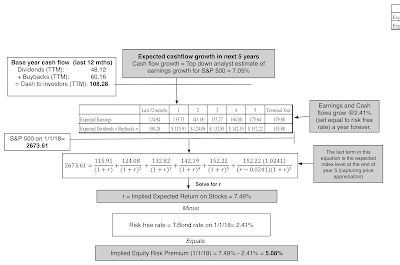 Based on the forward looking calculation you explained in class, I take as ERP for valuation the trailing 12 months cash yield value (5.96% in Jan '19) but I may be wrong (or inconsistent).